It’s a question that, clearly, Infiniti President Roland Krueger and vice president of product strategy Francois Bancon have heard before, given the small grin that appears at the corner of the latter’s mouth. It’s a question we’ve been mulling for some time though, given that, during the recent launch of the new Q50 400 Red Sport, Infiniti was adamant its new performance weapon should not be thrust into the same bracket as a BMW M3 or a Mercedes-AMG C63. “We want to go there. There is no question about it,” Francois explains. “We want to go there. There is no question about it. We’ll probably use an existing car, and probably as an idea – it’s an idea, not a project at this time – maximise the collaboration with The Alliance. I’m not going to tell you more, but of course, we are working on this. The alternative is you go exclusive high performance, which is stupid because anyone can do this. But that’s not what Infiniti is about. The reality at the moment then is on a much smaller scale, though that’s certainly not to dab the new V6 – the latest of a brand new ‘VR’ family of powerplants – with faint praise. These six-cylinders after all replace the ‘VQ’ 3.7-litre V6 that’s been in service for well over a decade in almost every model on Infiniti’s line-up. It also, significantly, marks the transition from natural aspiration to turbocharging. 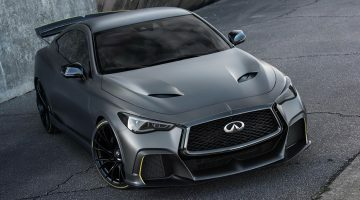 That ‘the future’ is a buzzword should hardly be a surprise given that Infiniti has debuted Direct Adaptive steering that replaces connecting rods with digital sensors, a new hybrid engine courtesy of its links with ‘The Alliance’ – i.e. the Renault Group and Daimler – and the Engineering Academy, honing talent for both the road and Infiniti’s Formula 1 links. Make no mistake, for Infiniti, the new twin turbo V6 is crucial. Fuel consumption has improved by 6.7 percent, with both peak power and torque now available across a wider range of revs thanks to a faster acting turbine and the valve timing system, the latter of which delivers quicker reactions to driver inputs. Even the size of the V6 is significant, the 19 percent downsizing reducing overall weight significantly. Back to the question of the performance sub-brand. Clearly the interest is there, and now so too is the foundation of a performance engine range, and while the Q50 may already be getting on in years, such prominent focus on the years to come suggest, surely, a future generation is being earmarked. Enjoy our Insight on Infiniti’s new twin-turbo V6 ?